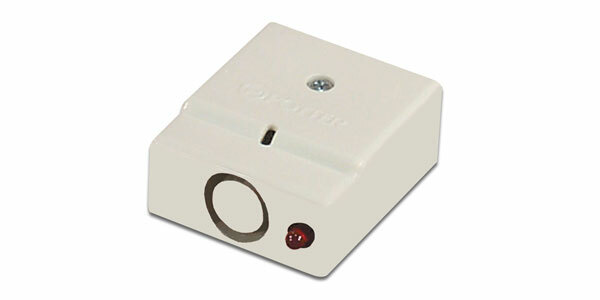 The Tech Works 5131 is a recessed Duress Alarm Push Button with Acknowledge Light designed for hidden alarm application under a Judge’s Bench, Bailiff or Clerk’s Desk, or Cashier/Teller’s Counter or Mental Health Counselor’s desk. An easy to “feel” button is recessed inside the unit allowing easy access under stressful situations yet is impossible to bump and cause accidental false alarms. When used with the Tech Works Duress-Call, the push of a button sounds a tone at the Master and lights a flashing LED on both the 5131 and the Master to indicate a call has been placed. When the call is acknowledged by the Master, the flashing LED changes to steady to indicate “help” is on the way. Included with the 5131 is the mechanical latching option. When used with the Tech Works Light-Call Maintain Closure electronics a fully supervised system monitors the button and sends an alarm if the button is pushed or the wire is cut. The Maintained Closure is reset by inserting a simple paper clip into a hole next to the button. This is a passive button and light assembly designed for use with Intelligent Substations. 12 VDC – @ 0 mA Minimum / 2 mA Max.